Based on Charles Dickens’ novel, Oliver Twist, it is London during the beginnings of the Industrial Revolution in the 19th Century; a harsh place to live if you are poor. Escaping the degradation of the industrial city and finding sanctuary from the ever-present crime and vice is something only money or luck can provide. You are attempting to find sanctuary for Oliver Twist. 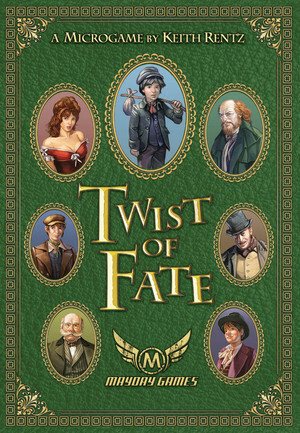 Through deftness of play, the gaining of Luck and Shillings, the player that manages Oliver Twist’s fate most efficiently and finds him Sanctuary by acquiring eight Sanctuary Points wins the game. A quick, "take-that" microgame based on a historical and beloved novel! These cards are double-sided and have Gives and Takes. What ever card that you give another player, that player either loses or gains Luck or Shillings. On the opposite side of the cards the player who plays the card loses/gains, as well. To do this, the players twist fate by twisting their Luck and Shilling cards! If a player reaches 4 of Luck or Shillings, they advance their Sanctuary Tokens to the next level. The first player to advance to Sanctuary at Mr. Brownlow's house at eight is the winner!